Fairfield, Iowa, should be on everyone’s bucket list of unique destinations. Is there another American town that contains so many worlds? In Fairfield, where 22% of the population lives below the poverty line, sprawling mansions loom over scruffy trailer homes. If you visit the Fairfield Arts and Convention Center, you might see an exhibit titled “Healthy Pollinators are Essential for Super Foods and Medicinal Plants” or, on another visit, a mixed martial arts cage match. In the checkout line at the Hy-Vee Grocery, the person in front of you might be a portly farmer in overalls buying a pack of Slim Jims and the person behind you a woman in a pastel sari with organic clarified butter from the store’s extensive vegetarian section. The biggest contrast in Fairfield is between the “townies,” the 8,000 or so residents whose parents and grandparents lived there, and the 2,000 people they disparagingly call “roos” or “gurus,” a reference to their leader, the Indian religious icon Maharishi Mahesh Yogi. The first of Maharishi’s followers arrived in Fairfield in the 1970s and transformed the town top to bottom. In the process, they changed the American spiritual landscape forever. Every step on the long, strange trip is on display in Transcendental Meditation in America: How a New Age Movement Remade a Small Town in Iowa (University of Iowa Press, 2014) by Joseph Weber. A professor of Journalism at the University of Nebraska, Weber devoted three years of research and writing to the project. The result is the deepest and broadest portrait so far of an important movement that gets little attention and less understanding. When Maharishi met the Beatles and intr­oduced them to Transcendental Meditation (TM), yoga and Eastern spirituality were mostly unknown in America. His marketing genius brought TM into the mainstream. By 1974, he was successful enough to purchase the Fairfield campus of the bankrupt Parsons College and transform it into Maharishi International University. Fairfield quickly became the center of the American TM movement and a microcosmic laboratory of spiritual upheaval. Relations between the two factions of Fairfield residents were shaky from the start. Weber provides revealing portraits of conservative townies and their idealistic counterparts in the TM movement. He profiles Mayor Ed Malloy, a “roo” who tries to serve the whole town while remaining true to Maharishi’s teachings. He also describes the impact of young entrepreneurs who moved to Fairfield for the blissful atmosphere. They often credit meditation for their success, if not their failures, which are sometimes spectacular. Weber also talks with people who claim the movement isn’t the peaceful, enlightened community it claims to be. A local farmer describes the trouble he encountered when he tried to start a hog feeding operation close to Maharishi Vedic City, a nearby community of the guru’s followers. The farmer became a national celebrity when Vedic City officials forced him into an expensive legal battle to save his land. The saddest stories come from people who gave their young lives to Maharishi but were forced to leave the fold. Some disagreed with TM movement policy and dared to speak out in public. Others were excommunicated for showing interest in other forms of spirituality. Is this really how enlightenment works? In many ways, Fairfield is a model for the changes happening throughout American society as the old ways yield to the new. The drama of changing generations, of red states versus blue states, occurred in miniature in Fairfield before it reached the rest of us. This unusual community is worth watching to see where we all might be headed. Maharishi died in 2008 and his movement passed out of the public eye a long time ago. Until now, the subject never got the serious scholarly or journalistic attention it deserved. 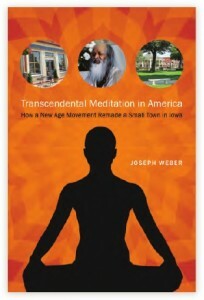 Joseph Weber’s Transcendental Meditation in America will be the standard work on the subject for a long time to come. The movement is probably a dead end, although it’ll be part of Fairfield culture for a long time. My question is: how does society learn to cope with its dead ends? The tea party and the climate change deniers aren’t going anywhere, either. I haven’t been to Fairfield in a while, but, as I recall, the various factions seem to have found a way to live with each other. That may be the example worth following. As for society coping, these days I live in the Netherlands, which presents a pretty good example of “living with each other.” The town I live in is a cultural zoo, containing people from completely different countries, wearing completely different garb, and believing in completely different gods, or no god. And yet for the most part, they get along, and even manage to have fun together. I lived three years at MIU in Fairfield, in the early 1980’s. Upon reflection, I see an early manifestation in that microcosm, of what Jonah Goldberg describes in his book “Liberal Fascism”. In the utopian town and university of Fairfield there was a smiley faced “soft totalitarianism” that forced citizens and students into certain patterns of behavior. Liberty and freedom of expression were minimized. Isn’t this what we have today with the fast growth of socialism and collectivism in our macrocosm of America? Hi, Peter. Thanks for the comment. I agree that the TM movement has an authoritarian side. I was in it for most of the 1970s and I saw increasing rigidity, groupthink, and pressure to conform. Honestly, it was pretty creepy. However, I wouldn’t call it liberal or collectivist. As you know, Maharishi micro-managed everything in the movement. The organization was a mirror image of the guru’s character, and he was about as far from a socialist as you could get. Personally, he was a hide-bound conservative who disliked women, blue jeans, long hair on men, and basically anything that happened after the middle ages. All of that filtered down into the movement where it became the standard dogma. So, was the movement authoritarian? Definitely. Conformist? For sure. Totally bonkers? You bet. Liberal? No way.